Wow... Today I was meaning to type "hotmail.com" into the URL entry in Chrome, but instead I typed in my hotmail account (which I use for email lists, etc. to avoid spam in my personal account). What came up as a result of the Google search was a list of websites containing fan fiction that I'd written over 15 years ago. That's when I was a fan of a Canadian series "Little Men" inspired by the Louisa May Alcott book. I was also a fan of "The X-files" and was a few years past my "Star Trek: The Next Generation" phase. I wrote fan fiction - poetry and short stories - based on all these shows. Seeing it all pop up again after all these years is a little surprising... and a little embarrassing. But I have to say that I'm impressed by some of the stuff I wrote. Why I never chose to write more seriously is a bit of a mystery since life always takes me back to writing, but I've never been very good at coming up with original ideas. Even now, whether I write, work or explore my artistic talents, I do better at bringing other people's ideas to life and expanding on them than coming up with my own ideas. Ghostly passed by my window. Had it been only a dream? Jewelled starlight appeared to guide me. Minding I not wake the others. Open to the spectre before us. Wanting us to know our truth. Zigzag courses are now set straight. This year, I will have completely filled a journal for my son. It's a record of firsts, events and memorable quotes from the first 8 years of his life. Along with the thousands of photos that I've taken of him over the years, the journal provides a glimpse back at his life and how much he's grown and changed. 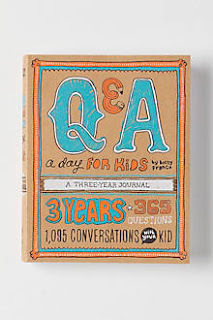 I found this Q&A book recently which is another way of capturing a glimpse of your child's thoughts over the years. It's a fun way to find out how quirky your kid's imagination can be, or it can be a conversation starter. Some of the questions may also reveal things that bother your child that they may too afraid to mention. So, it's been 2 years since I last posted to my blog. I fell off the writer bandwagon... With work and "real life" commitments (motherhood being the biggest one), the only way I felt I could juggle everything was to stifle my creativity. 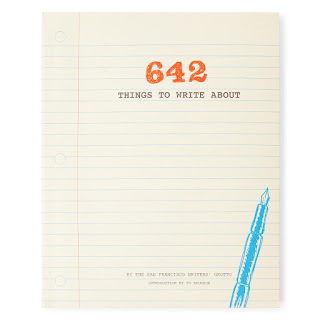 I have kept a notebook and written down the occasional story idea, and I keep a journal, but to dedicate any part of my day to creative writing just seemed like a luxury I couldn't afford. Maybe I still can't... yet... but I'm going to try to keep writing. The first question in the book: "What can happen in a second?" In one second, a seagull can fly by, night can turn to day, an orchestra can crescendo to a forte. A friend can give a hug, or I can give my son a kiss. I can savour a piece of chocolate, or finish creating a masterpiece. Sold internationally, I Love You 5 Lollipops was included in the New Title Showcase of the Shanghai Children’s International Book Fair in November 2013. The follow up in the series titled, Elizabeth Rose on Parade will be released in September 2014. Jaquelyn is the mother to two girls and the owner of the overindulged diva cavoodle, Millicent Olivia Muller (aka, Millie the worst best dog in the world).Collaborating in creative relationships is one of Jaquelyn’s favourite things about writing for children. Whether working with other authors, illustrators or discussing story ideas with children, she believes in the deep level of trust in handing over your creative vision and asking others to invest their time in it. Jaquelyn is an author champion for the Let’s Read national early literacy campaign and is a member of SCBWI, the ASA and CBCA Vic. Q1: What am I working on? Although I haven't set a deadline for my next book, I do have a few ideas floating around in my head, some of which have been jotted down in point form. The one idea of all these which I am hoping to pursue in the next couple of years would be a follow-up to The Littlest Knight. Nicholas will learn a new life lesson as he encounters more new friends on a fresh journey through the forest near Sterling. Q2: How does my work differ from others in its genre? I can't say that I've ever considered how my work differs from others in the same genre; however, based on the books that we've often brought home from the library for my son, my method of writing is much more detailed and lengthy for the age group that I've targetted. That said, I was able to collaborate successfully with my illustrator (the talented Darren Bird) to find a balance that highlighted both text and illustrations equally. Q3: Why do I write what I write? My first book was a labour of love, and everything I write is inspired by the people around me. My husband, son and I enjoy visiting the Sterling Renaissance Festival each summer, so it seemed natural to write about a little boy who wants to be a knight. Q4: How does my writing process work? I need to think about what I'm going to write for a long time before I'll commit the ideas to paper. Although I'm a creative person, ideas from scratch have never come easy to me. The ideas for my stories need to connect somehow into a workable flow before I start jotting points, drafting paragraphs, and doodling images that might eventually also help to inspire my illustrator. Writing a book is not something that necessarily comes easily, but being able to express oneself through words is a precious gift. Seeing those words inspire someone else to draw amazing pictures to accompany the story is also a feeling that can't be described except to say that it's pretty awesome. Although I wrote my first book for my son, it was something that I really wanted to share with others, and I hope the story of The Littlest Knight inspires at least a few children to follow their dreams. Being new to the world of writing, the number of authors I know personally is quite small. Having a full-time job and a son means that I have little time to devote to networking with other children's authors, but I have been fortunate to know a few other amazing working women who somehow have found time to author children's books. One of these ladies is a much published author of novels, short stories and children's books; the other two ladies are working mothers who felt the desire to share a story that represented something special in their lives. Camila Reimers is a language teacher who works for the same company where I work as a Senior Application Support Analyst. 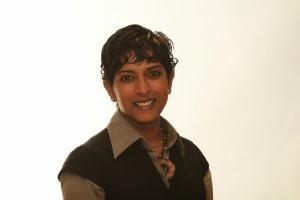 Meena Kothandaraman was a classmate at the University of Ottawa where we graduated in the same class with a degree in Management and Information Systems. Janice Dean was a classmate of my brother's in high school, just a year behind me. I hope you'll read their stories, and help me spread the word about their wonderful books. Born in Antofagasta, Chile, Camila immigrated to Canada on July 1, 1980. 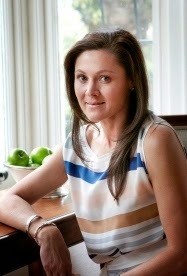 During the 1980s she lived in – Vancouver, Montreal, Sudbury – before moving to Ottawa with her two sons in 1990. 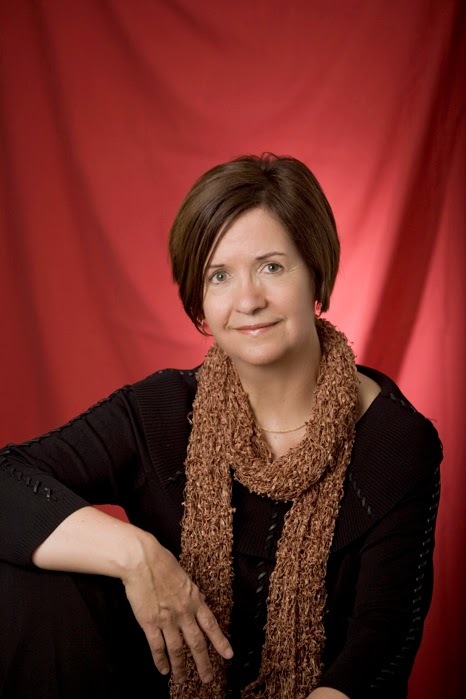 The author of three novels and numerous short stories in Spanish, she has been published in Canada, Europe and Latin America. Camila studied education at the University of Chile and Language Arts at the University of British Columbia in Vancouver, Canada. She is currently a radio host at CHIN radio Ottawa, in charge of the only Spanish program for children offered to the community. In 2013, she won the CEMA (Canadian Ethnic Media Association) award as the best ethnic program in the country. She also has a monthly column for children in the local Spanish newspaper "El Eco Latino". Some of her work also forms part of the Adrienne project, which Governor General Adrienne Clarkson dedicated to Chilean writers in Canada. These stories can be found in public libraries in both Chile and Canada. Camila is currently working as a Spanish teacher at Export Development Canada.She has always loved writing, from the moment she opened her first reader, she knew that she wanted to write. She wrote her first story when she was only six years old. Camila's first children's story is entitled Why Chile is a Long and Narrow Country. "I would like to share the feeling that writing is more than just inspiration, it's a skill that you never finish improving. You have to be passionate and work every day. My Spanish students laugh when I tell them that I do as much homework as they do. Every day I study the language in order to play with words in a better way." When Meena and I studied together at university, even as she excelled in the subject matter at hand, she also continued exploring an artistic side through singing and the violin. Thanks to the internet, we reconnected some twenty years after graduation, and it didn't surprise me at all that she was successfully balancing a career, a family and her extra-curricular endeavours... including authoring a children's book. Aside from being a writer, Meena is Director of Experience Research at a User Experience boutique called Motivate Design, and she works as a Lecturer in the Human Factors and Information Design program at Bentley University in Waltham, Massachusetts. Her job is to look at the user experience from the user point of view, and research and strategize around helping organizations adopt this point of view. What inspired you to write your first children’s book? My first book Can You Say My Name? was based on multiple aspects. "Kids who have "non-mainstream" names sometimes shy away from their names, or allow people to mispronounce their names. Similarly, children who cannot pronounce an unfamiliar name might never realize they are saying someone's name incorrectly. As a child, I had a difficult last name, and realized that so many kids just need to be given the confidence to share their names the way they were meant to be pronounced. A name is such a big part of who we are, and is with us life-long. By teaching children to be proud of their names, and also respectful of other names, I hoped the book would open up the conversation in classrooms so that kids could ask for help when forgetting the way a friend's name is pronounced. I wanted the story to be easy to read for kindergartners. My children were in those grades at the time, and I used them as my inspiration to understand just how simple their world is. Family is very important to me, and I wanted the family to play an integral role in the book as well. This book is the beginning of a series that addresses the "dual life" that children of multicultural heritages often live. Names, different spoken languages, eating different foods, etc. are all topics I am addressing with my series. This first book therefore needed to be simple, so that parents and children could read and share the content together. The story focuses on the first day of school, and the anxiety that one of two main characters has with her different name. Starting kindergarten can be taxing for a lot of kids. Starting kindergarten with a different name can be even harder to manage. This child was equipped with an important lesson from her mother. She ends up using that lesson, and with the support of her twin brother successfully appreciates what her mother empowered her to do: teach your friends how to say your name properly. Be proud of your name. Can you share your experience in how you developed your story and then how you went about publishing it? I did try traditional routes to publish this book. I had a wonderful illustrator, Amy Nichols, do some marvelous work on my book. I was careful to make sure that all legal paths were also addressed, and put in for a copyright and appropriate rights for the book. I submitted my book to well over 50-60 publishers, having done my research that showed that there were no books that addressed multicultural aspects of life for kids growing up with one, or possible two or three different cultures. Unfortunately, the publishers did not feel the material was interesting. I even had the ex editor of the New York Times Magazine review my book, and he was incredibly appreciative of the content. He was quite disappointed when he found out that the book was not accepted for publishing. That didn't stop me thankfully. I moved over to self-publishing, and eventually was able to move through the channels easily. The book has done very well - and I've sold over 1,000 copies of it. Do you have any other writing projects in the works? Meena is currently working on another book for her series called Can you speak Hinglish?. This talks about the dual language situation that many children grow up with (learning one language at home, and speaking mostly English at school). She also has three other books in the series, ready for publication. Is there anything you would like to share with your readers or other writers? To my readers and to readers of children's books - one of the best things about reading is you learn so many different perspectives. I was a child who had a complex name, and then had children who also had non-traditional names. Being able to look at it from both perspectives really gave me the inspiration I needed to start the series. To other writers - I wish you so much fun in the journey. I feel fortunate that we have the venue of self-publishing to enjoy the fruits of all the hard labor and love that goes into writing. Regardless of whether you are accepted by major publishers, if you can even touch one person with your writing, it really does make all the difference. Born in Toronto and raised in Ottawa, Janice now calls New York City home. As well as being a mother and author, she also has a busy career as Senior Meteorologist at the Fox news channel. I wanted to write a children’s book that introduces kids to weather concepts. I saw my little boy Matthew (about three at the time) in the tub one day wringing water out of a washcloth and saying, “Mama – it’s a cloud!” And I was so impressed. Over the years colleagues and friends have come up to me and asked my recommendations for books about weather to give to their kids for Christmas and Birthdays. I did my homework, and found out there really isn’t a lot out there for children that have a fun story line along with information about the atmosphere and the weather that affects our daily lives. Freddy didn’t come out of nowhere, though. I’ve had an idea of a children’s book with a weather theme for years. Many of the characters and the story line came to me while I rocked my youngest boy Theodore to sleep at night! Getting Freddy the Frogcaster published was no easy feat. It took me several years and many storylines until I finally got it right. The first publisher I approached gave me positive feedback about the general concept of a weather book for kids but said I needed to develop a solid storyline. For a children’s book, that meant a great character. I kept coming back to a frog, and the more research I did on frogs, the more it seemed perfect. I read that frogs will croak loudly to warn each other of bad weather on the way! And the alliterations were plentiful – Sally Croaker, Polly Woggins, the Frogs News Network… After many many drafts,” the story of my aspiring "frogcaster" found a home with a small publisher that nurtured my story to completion, including an amazing illustrator (Russ Cox) whose vision matched mine. I’ve already written two sequels to Freddy that will be published this fall (2014) and next year. The next book is called Freddy the Frogcaster and the Big Blizzard where Freddy helps to forecast a big winter storm coming through his lilly pad. And then the following book will focus on a hurricane. I think Freddy can be a great teaching tool along with parents and teachers to explain why this type of weather happens, what to do and how to be prepared. One of the morals in my story is hard work pays off, and that can certainly be said for trying to publish a childrens book. It took me a number of years but I kept coming back to it and making it better. The story is cute and I’m proud of the fact that it’s educational but it’s a vibrant book. Reaching out to the world! I finally buckled down and was able to set up a vendor account at Amazon.com. Both The Littlest Knight and Le plus petit des chevaliers are available through the online site. The French version of The Littlest Knight was delivered to my door on Thursday morning! 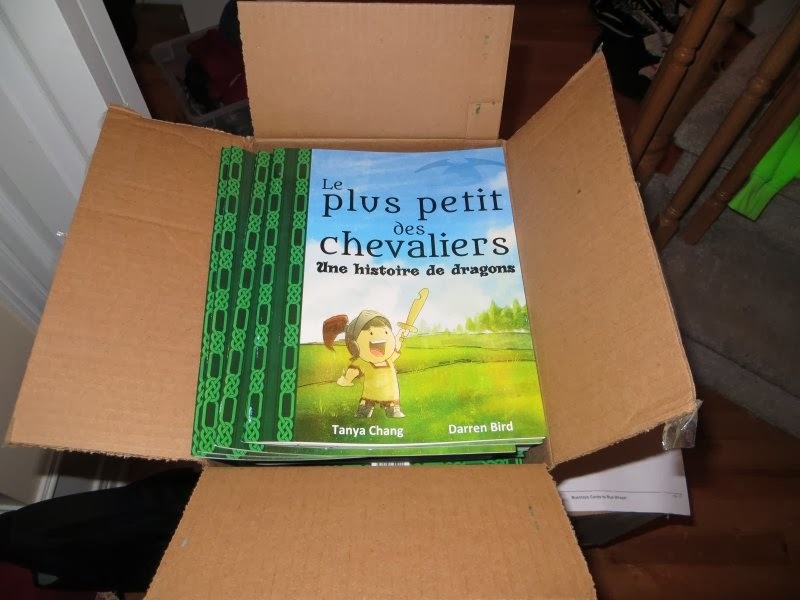 Being faced with selling 500 copies of a book in my second language is daunting, but it is still exciting to know that the story can now be shared with that many more people... and in French! Of course, the arrival of the books required a bit of quick action on my part. My amazing illustrator, Darren Bird (http://huetwoart.com/) was scheduled to be at Ottawa's Pop Expo this weekend, so I had to get copies to him before the event. I drove to his place over lunch and we sat down to catch up and to sign 100 copies of the book. In Canada, the National Library also requires a legal deposit of the book, so those were mailed off quickly. It's pretty neat to think this book, in both languages, has become a piece of Canadian literary history! Then, the first few copies were shipped off to eager readers: my friend and editor, Roxane Delisle; a former co-worker and my initial proof-reader for the French version, Stephan Vermette; and a copy for Milo, the son of a long-distance friend who lives in France. I even had a few pre-orders to fill, and a couple of books were donated to my son's school for their library. It's thrilling to know that there are already children out there who will be able to read this book during the holidays. So, next year's task will be to step up my marketing plan, perhaps do some readings (with an abridged version of the sotry), and look into the possibility of finding a publisher who might take the book to the next level. And, yes, I plan on working on another Littlest Knight story, but I don't expect that it will be done for at least another few months. Perhaps that will be my holiday project to have the first draft. Stay tuned! I know I haven't been very diligent about updating my blog, but the year is coming to an end, and I can finally post with certainty that the French translation of my book will be available before Christmas! 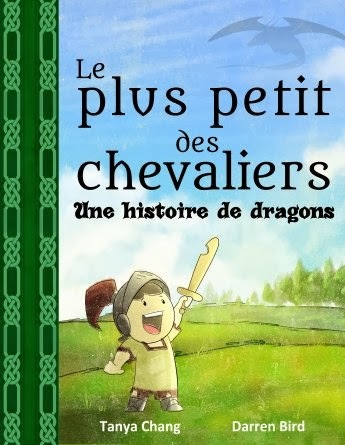 I set up the Etsy listing to take pre-orders, and the toy store that carries The Littlest Knight will also be selling Le plus petit des chevaliers as soon as we have copies. My next task will be to write condensed versions in English and French so that I have something a bit shorter for public readings as the entire book itself can be a bit lengthy for these events. I've already been approached about doing a reading and selling the book at the next book fair at my son's school. It's a bit daunting given that French is my second language and I'm not fluently bilingual, but it's a challenge I'm willing to undertake! For the translation of the book, I gratefully aknowledge the contribution of Roxane Delisle, a friend and professional translator, who agreed to edit the book. Also, a huge thanks to a former co-worker Stephan Vermette, who proof read my initial translation of the book.